Fungi are the main causes of dogwood tree diseases. Fungi thrive in cool, wet weather and prevention is the best cure. 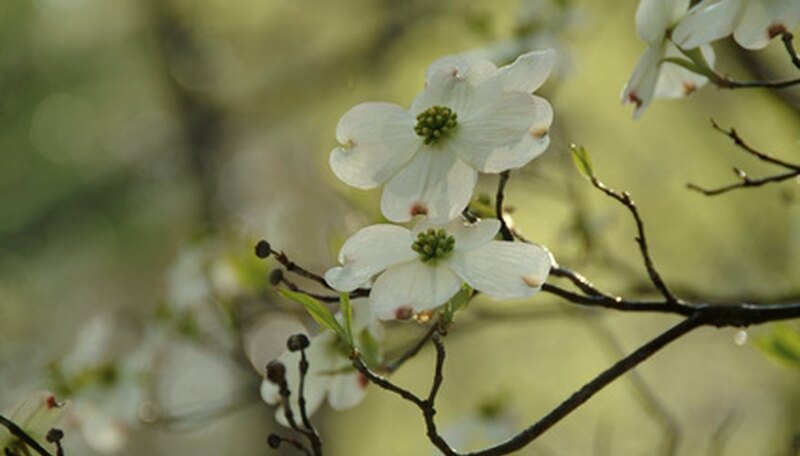 To head off fungal diseases, plant dogwood trees with enough space between them and other plants so that air can circulate around the tree. Check the leaves and make sure rain water does not make little puddles. Remove any infected parts as soon as they appear and dispose of them, preferably by burning. Fungal diseases can ruin the look of the tree and, in the worse cases, the tree will not survive. Dogwood anthracnose is a fungal disease caused by the Discula destructiva. The disease was first discovered in New York and Pennsylvania in the latter part of the 1970s and since then has been found in Maryland, West Virginia, Virginia, and reached western North Carolina. The disease appears as small leaf spots surrounded by a purple border and/or large tan spots on the leaf margins. On affected trees, leaves remain on the tree throughout winter. The fungus can spread to other parts of the tree and the tree can die. Prune away any diseased twigs and branches and dispose of them. Fungicides can help and should be used in combination with proper maintenance. Spot anthracnose is caused by the Elsinoe corni fungus and attacks the flower petals, leaves and the young branches of dogwwod trees. The disease appears as small red-purple spots on the petals in early spring. As the disease progresses, the spots form larger lesions. The young buds become disfigured and fall off. On the leaves, the centers turn a pale yellow-gray color and fall out leaving the leaves full of holes. The leaves will be small, distorted and eventually die. The young branches and fruit show scabby lesions. Root rot can be caused by several different fungi. The fungi live in the soil and attack the roots when they become injured or get water-logged. Since the infection starts below the soil line, the disease is not evident until other parts of the tree are infected and by then, it is too late to save the plant. The leaves will yellow, with the edges dying and the branches will die back. Keep the tree healthy with a good fertilizer, be careful not to wound the tree when pruning, and make sure the soil is well drained. If the tree becomes infected, remove and destroy it and all of the roots. Other plants planted in the same spot will be vulnerable since the fungi live in the soil.